LG V20 features a 5.7 inches (72.4 screens to body ratio) IPS LCD capacitive display touchscreen with 16M colors. The resolution of the smartphone is 1400 x 2560 with a high pixel density of 513 ppi. With the multi-touch gesture, the device is protected by Corning Gorilla Glass 4 with a secondary display, 160 x 1040 pixels and LG UX 5.0. The smartphone is powered by Qualcomm MSM8996 Snapdragon 820 coupled with Quad-core (2 x 2.15 GHz Kryo and 2 x 1.6 GHz Kryo) and Adreno 530. 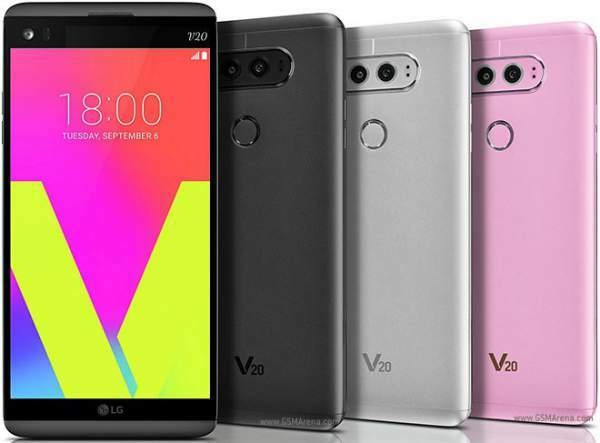 V20 runs on Android OS Nougat v7.0.LG is offering 4 GB RAM with an internal storage of 32/64 GB. The internal memory can be expandable up to 256 GB by a dedicated slot for microSD card. Over the camera, the device has Dual primary camera. One is 16 MP camera with an aperture of f/1.8 and other is 8 MP camera with an aperture of f/2.4. The primary camera features laser and phase detection auto-focus, 2x optical zoom, Geo-tagging, HDR, panorama and face detection. On the front, there is a 5 MP shooter for selfies and video calling. The camera of this phone can record a video at 2160p@ 30fps. The device has a 3.5 mm audio jack with B&O Play certified and active noise cancellation. Other connectivity options like Wi-Fi 802.11, Wi-Fi Direct, hotspot, Bluetooth v4.2, GPS, NFC and Infrared port. The device has a fingerprint sensor, accelerometer, gyroscope, proximity, compass and color spectrum in the device. There is a removable Li-Ion 3200 mAh battery packed with the phone. The smartphone supports Quick Charge technology v3.0 which helps in fast charging of the smartphone.The dimensions of the phone are 159.7 x 78.1 x 7.6 mm (6.29 x 3.07 x 0.30 in) and weighs about 174 gms (6.14 oz). The device features GSM/ HSPA / LTE network technology. The device comes in Titan, Silver, and Pink colors. The device will cost about KRW 899,800 in South Korea ($ 803 or 718 pounds). The rival of V20 (Samsung Note 7) is priced at $883. So, the company will keep in mind the price of the smartphone while launching the device. Let’s wait and see what the company actually offers to its customers.